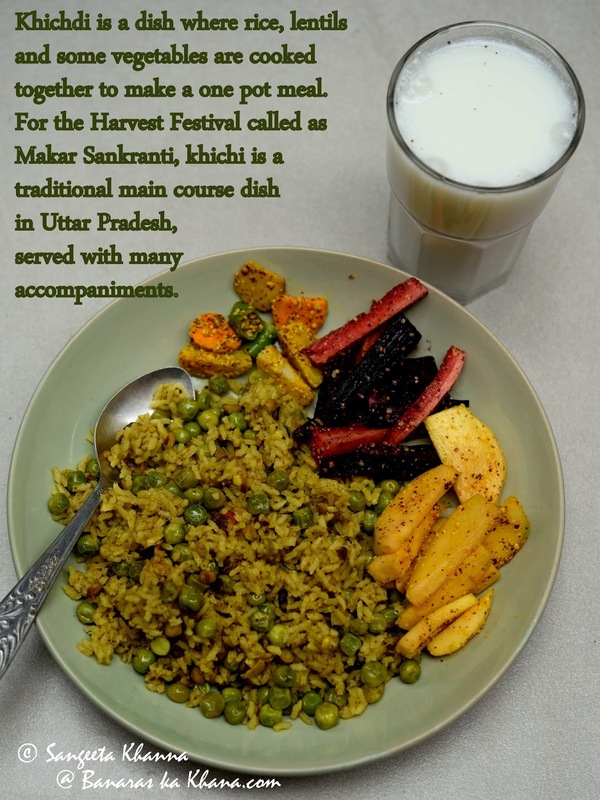 Makar sankranti (a winter harvest festival in North India) is called as khichri or khichdi too in Eastern UP, probably because all new crop lentils and rice is cooked into a khichri on this auspicious day. This khichri is served with many small tidbits like a bowl of ghee, fried or roasted papads, a few chutneys both savory and sweet kind, raita or some kind of dahi (yogurt) preparations like dahi vada, a few seasonal pickles etc etc. The number of dishes would be directly proportional to how much the lady of the house can cook or how much the other members are enthusiastic about the khichri. An array of sweetmeats made of khoya and sesame and other nuts adorn the table as well. Sesame and nuts sweetmeats called tilgud are so synonymous with Sankranti in the north. Back into my childhood, we were all a bunch of foodies who loved pitching in to cook or prepare something or the other when such feasts were the order of the day. Makar sankranti being a holiday helped a lot. I am always reminded of my Daadi (grandmother) whenever I think about such traditional meals or cook them myself. She would have made a quick green chutney and a kachumber style salad if the same meal was served on the table in her presence. She always liked the meals to be pepped up with chutneys and raw salads even if the cooking has been basic. I fall for basic coking and one dish meals whenever pressed for time or otherwise too. Khichri is an all time favorite and I would have cooked it more frequently if the husband was not so allergic to the sound of the word 'khichri'. He eats it alright when I cook it though, but rejects the idea of khichri every time I ask. It so happened on the day of Makar sankranti this year too. We were just back from Goa the previous night and he had to join office in the morning. I wanted a home cooked comforting meal for myself and didn't want to cook separate things for both of us. His lunch box was also to be cooked to my despair, early in the morning. Such things feel like a pain when you are just back from a fun holiday. Anyways, I asked him if he would like to have khichri in his lunch box and he said no straight away. I asked what about a pulao with some daal in it, he said yes. I know you would say I am manipulative. I agree I am. I soaked the lentils in the night so a quick khichri would be ready for the day of makar sankranti. A comforting home cooked meal after 2 weeks of Goan food and a festival being celebrated in it's warm glory too. Both tasks duly accomplished. Call me manipulative but I cooked the khichri alright. Just like it was done in my mother's home. Soak the lentils well in time, at least 3 hours or overnight. Drain and keep aside. Wash the rice, drain and keep aside till you do the other preparations. Heat the ghee in a pressure cooker pan and tip in the dry red chilies and cumin seeds first. Let them crackle and then add the chopped ginger and whole spices and remove the pan from the burner for a while so the whole spices don't get charred. Add the soaked and drained lentils, green peas and the powdered spices and toss them all so everything gets coated well with spices, and get aromatic in about 2-3 minutes. If cooking a larger quantity you would need to prolong this step till the aroma of spices is evident and the lentils look a little cooked. Add the drained rice, add a cup of water and salt to taste, fix the lid of the pressure cooker and let the pressure build up. Wait till the first whistle and then lower the flame and cook for 2-3 minutes more. Let the pressure release by itself, open the lid and let the steam out. Fluff up the khichdi with the help of a folk. Serve as required. This khichri tastes good at room temperature too. I packed this for Arvind's office lunch with a separate box of sliced carrots. He got plain yogurt from his office canteen, while I made a carrots and onion raita for myself that day. 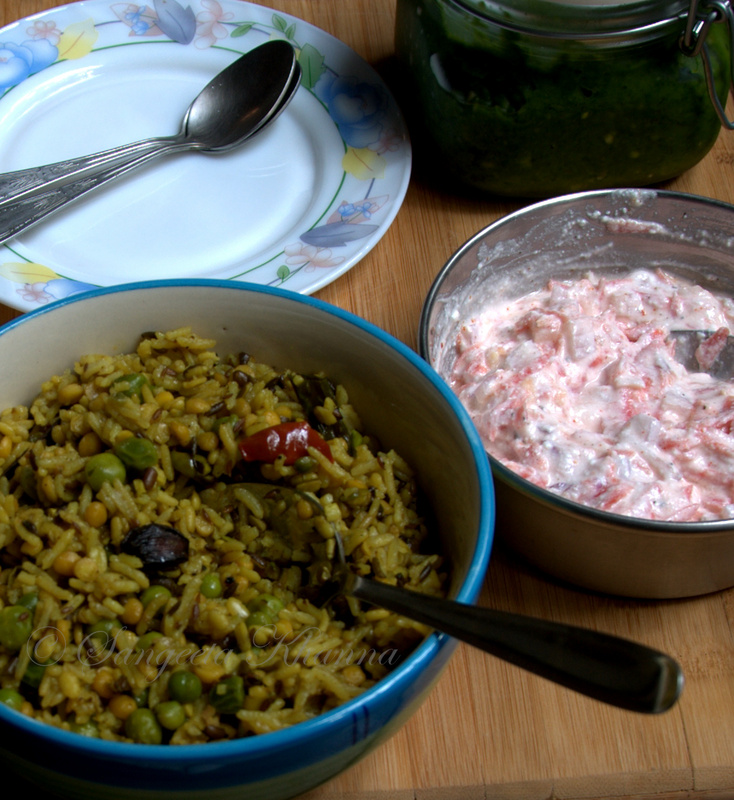 The hare lasun ka achar was a good accompaniment to this lovely khichri too. Some people like adding garlic to the khichri, some love a topping of fried onions on top and some wouldn't touch a khichri without a huge dollop of ghee glistening on a plate of khichri. Some would love it with a typical UP style chokha and some bhujia. 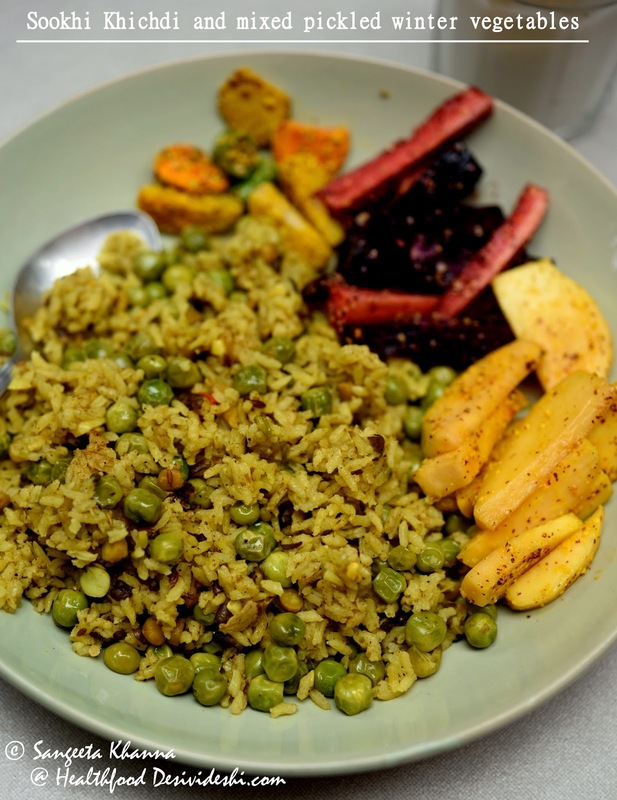 Dress it up as you like, this winter special khichri with green peas and two types of lentils together is a delight to have for lunch. Here is my khichdi platter of 2016, it was made in a hurry again but served with some seasonal winter pickles that we love having as salads. Read more about these seasonal pickles here. Very interesting khichdi... no wonder your husband fell for the con! It actually does look more like a pulao in its consistency. I remember this, my neighbor in India was from Bihar and she used to make this on that day. love it.